Solar energy has been proven to be the much needed solution to places where there has been little or no power supply. Infrastructures are been put in place to see that the world is lit up as soon as possible. As beautiful as this plan is the ever increasing population of the world is standing as a barrier to achieving this with the current population increase rate standing at around 83 million people per year. This has made energy distribution much tougher. With that been said a new scheme for renewable energy saving is earmarked and this looks like a breakthrough in the system. The new system allows energy consumers to take advantage of other users who produced more energy than they need. In a world where an individual is using energy that enough to power 5 or 6 more houses, this idea stands the best. A consumer through the selling of excess energy will be able to turn the excess which is been wasted before into profits. This innovation brings about a peer-to-peer method of energy sharing with a lot of benefits. The P2P energy concept would also allow people who didn’t have solar, or who couldn’t put on solar, to have access to energy from friends, neighbors or companies who are willing to share theirs for a profit. With the emergence of blockchain technology, P2P energy sharing has become much easier. The idea is that this type of decentralized technology (blockchain), when applied to the energy sector, will allow people trade energy amongst each other freely across a vast network of end users without going through any middlemen. With this energy, providers can raise capital by issuing their own energy tokens that represent a certain unit of energy, and investors can either consume these tokens for their own needs or resell them down the road if they have an excess. This promises to rapidly speed up transactions as well as cut down on costs through a peer-to-peer process without any intermediaries. Solarex Technology with the aid of smart contract on blockchain technology aims to implement this as a mainstay energy giant in the blockchain energy sector with the use of smart contracts, end users will be able to purchase the token provided by Solarex to feed their energy supply back to others. The energy solution start-up aims to put forward blockchain model that will disrupt, decentralise, decarbonise, digitalize and democratise this access to energy for all. 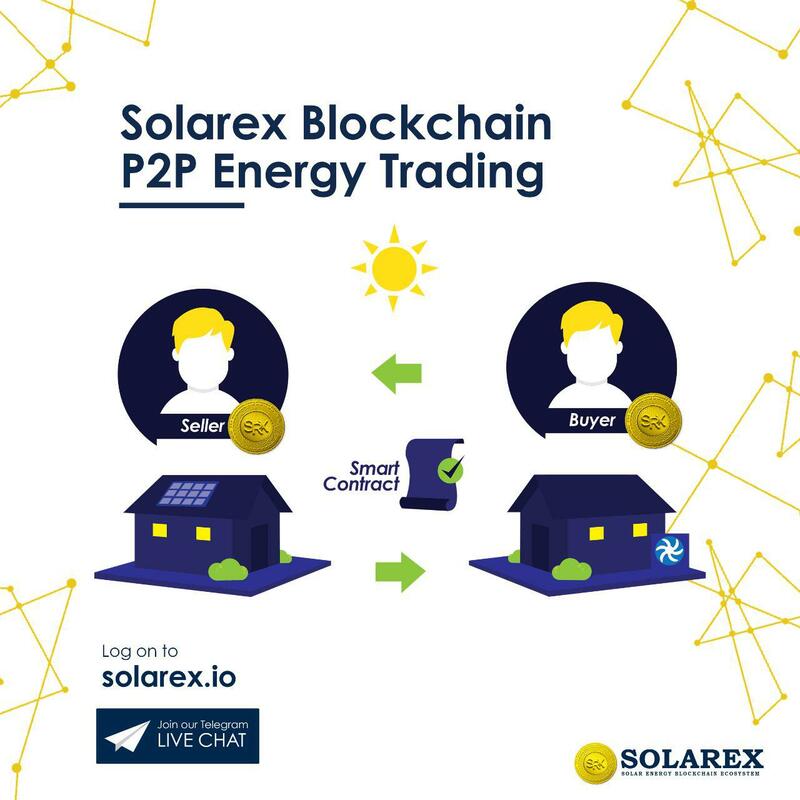 With the provision of its Utility token (SRX) which will have multiple uses in the Solarex ecosystem users will be able to purchase energy from Solarex ecosystem, transact payment in the P2P energy marketplace, make cross border incentive and referral payments, service purchase, project financing, loan repayment, access product discount and community development program.